Need a fluffy, light frosting that holds its shape well? 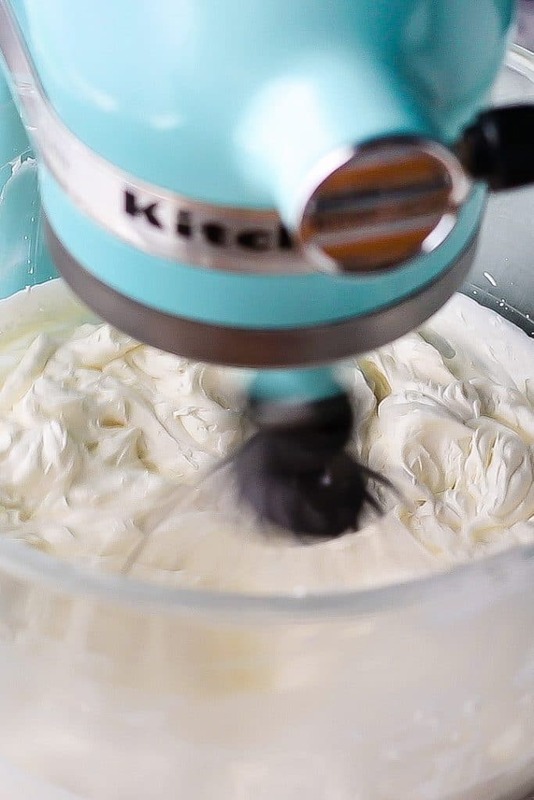 Look no further than this whipped cream frosting recipe! Made with just 3 simple ingredients. It’s more stable than regular whipped cream and is perfect for any make-ahead dessert! I’m so happy to finally be sharing this whipped cream frosting with you today! It’s a component of so many other recipes on this site, including my Tiramisu Cake, Black Forest Cake, and Banana Pudding Cake. But it’s never had it’s own dedicated recipe post. Until now! I love this recipe and I make it often. It works as a frosting or filling, as well as a topping. You can pipe on cupcakes, spread it on layer cakes, or dollop it over all sorts of desserts. It would be perfect with angel food cake or pound cake (I’ve got a lemon pound cake and a marble pound cake recipe that you’d love), along with a handful of fresh berries. And it’s a little more stable than regular whipped cream, so you can make it up to 48 hours ahead and it will keep its shape without deflating or weeping. So what’s the secret to this magical whipped cream? There are actually a few key ingredients that make this frosting special. WHAT IS IN WHIPPED CREAM FROSTING? There are only 3 simple ingredients in this recipe, but each one serves a specific purpose. The first ingredient is cream cheese. Cream cheese keeps this whipped cream extra thick and firm. It lends a slightly tangy flavor, but it’s very subtle and not at all overpowering. It compliments Red Velvet Cake or Carrot Cake perfectly. Be sure to use the kind of cream cheese that comes in a brick. The kind in a tub is not meant for baking. It’s meant for spreading on bagels, so it’s really soft and your frosting won’t come out right if you use that. You need the full-fat, dense cream cheese that’s sold in 8-ounce bricks for this frosting. If you don’t want to use cream cheese, mascarpone would be a great substitute. It’s a super-creamy soft Italian cheese that has a milder, more buttery flavor than American cream cheese. The next ingredient is powdered sugar. This will serve to sweeten the topping, but powdered sugar also has a little bit of cornstarch in it that will help to stabilize the whipped cream. The final ingredient is heavy whipping cream. If you are outside the U.S., you might know this as “double cream.” It’s very thick and rich. If you use light cream, table cream, or half and half, it will not whip up right and you will have a runny mess on your hands. Look for “heavy” cream, “whipping cream,” or “double” cream. Start by mixing the cream cheese and powdered sugar together. Just blend them together until they are smooth and combined. It’s totally fine if the cream cheese is cold. Many dessert recipes specify that the cream cheese should be softened, but for this topping you can use it straight from the fridge. This step can be done with the paddle attachment OR the whip attachment. Next, you want to use a silicone spatula to scrape the bottom and sides of the bowl. This will really help prevent lumps in your whipped cream frosting. 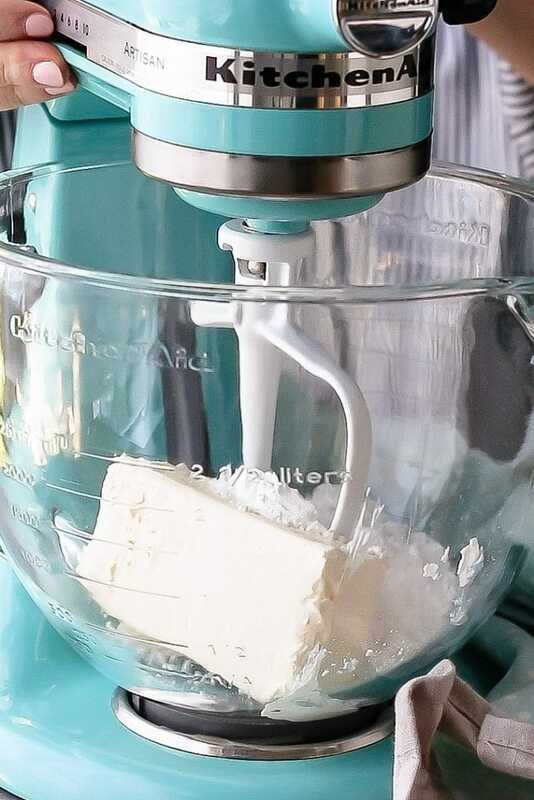 Place the whip attachment on your mixer (if you’re not already using it), and drizzle in the cold cream in a slow, steady stream, while the mixer is running on medium speed. Every so often, turn the mixer off and scrape down the bottom and sides of the bowl again, so that any lumps of cream cheese that may be clinging get incorporated, before too much liquid goes in. Once all the cream has been added, turn the mixer up to high speed and whip until the icing becomes nice and thick. This should take no more than 2 to 3 minutes. If you whip it too long, you could break it down and it could separate or become runny. So just as soon as you see it thickening up, turn off the mixer because you’re good to go! IS THIS WHIPPED CREAM FROSTING GOOD FOR PIPING AND DECORATING? This frosting pipes very well. It may seem a little loose when you’re putting it into your piping bag, but somehow it magically firms up while it’s in there. If you’re concerned about it running out as you’re filling the bag, clip the end with a clothes pin or binder clip. When you’re ready to pipe just release the clip. 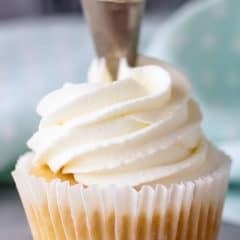 I typically use an open star tip or a french star tip to pipe this whipped cream frosting on cupcakes. It pipes beautifully for this type of decoration. I’m not sure I would use it to pipe roses or write on birthday cakes though. For something like that, you’d probably be better off with Swiss meringue buttercream or American-style buttercream. CAN THIS FROSTING BE TINTED? If you’d like to tint this frosting, just add a drop or two of gel paste icing color to the finished frosting. 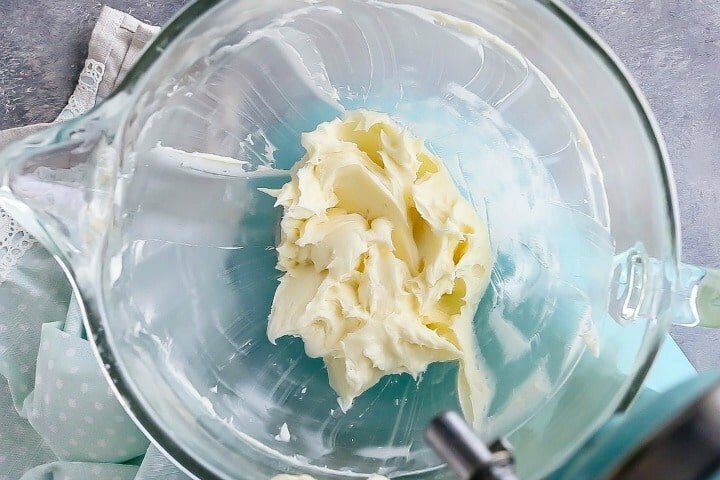 This whipped cream is much more stable than regular whipped cream (aka: Chantilly cream), which only lasts for a few hours before it starts to weep and lose its shape. With this recipe, you can make and frost your cake or cupcakes a day or two ahead. It’s best when kept cold, so keep your dessert refrigerated until you’re ready to serve it. After about 48 hours, the whipped cream starts to give off some of its moisture. If it’s on a cake or cupcake, it’s fine because the moisture just soaks into the cake and that is delicious in its own way. But if you make it ahead and just store it in a bowl, you may notice that the frosting at the bottom of the bowl is looser and not as fluffy as what’s on top. So, if you’re using it as a topping I would recommend making it no more than 24 hours before you serve it. You’re going to love how easy it is to make this whipped cream frosting, and how convenient it is to be able to make it ahead. Plus, there’s no fussing around with gelatin! Let me know how you decide to serve it in a comment below. Need a fluffy, light frosting that holds its shape well? 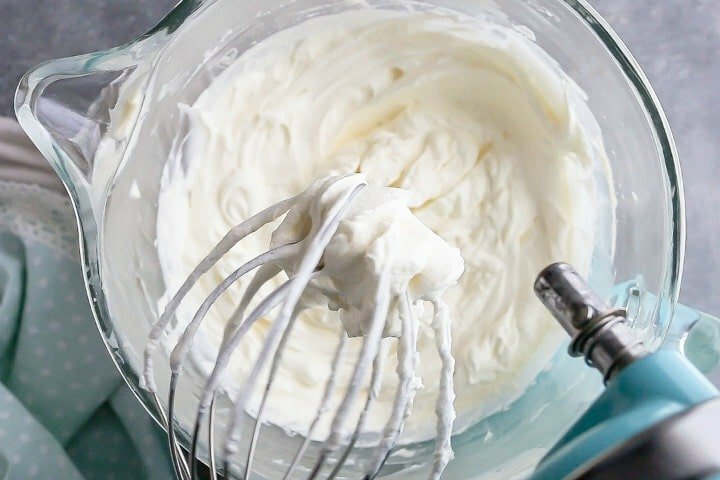 Look no further than this whipped cream frosting recipe! Made with just 3 simple ingredients. It's more stable than regular whipped cream and is perfect for any make-ahead dessert! Turn the mixer down to medium-low speed and pour the heavy cream down the side of the bowl in a very slow and steady stream, stopping every now and then to scrape the bottom and sides of the bowl with a silicone spatula. Fold in the vanilla extract, if using. * Do not use cream cheese from a tub. Look for the kind of cream cheese that comes in a brick for this recipe. Can be made up to 24 hours in advance. Makes enough to fill & frost 1 triple-layer 8-inch cake, 1 double-layer 9-inch cake, or 2 dozen cupcakes. Perfect for Black Forest Cake, Red Velvet Cake or cupcakes, Banana Pudding Cake, or Tuxedo Cupcakes. What do I do if it doesn’t appear thick enough for decorating a birthday cake? Try whipping it just a minute longer Debbie! Good luck! So glad to find this whipped cream recipe for my Black Forest Cakes! Yay! So happy you like it Shirley! I use it for Black Forest too- my recipe is not authentic but we love it and there’s no booze so the whole family can enjoy: https://bakingamoment.com/black-forest-cake/. This is what I use as a Cool Whip substitute! It’s divine! Do I use Philadelphia cream cheese? That is what I usually use, yes. So do I have to make cake? Or can I just eat the frosting? It looks amazing! I have a dessert tasting coming up and was looking for a stablized whipped cream for strawberry shortcake and because it’s summer, regular whipped cream won’t work. Thanks! I think you will love this one Craig! Definitely more stable that regular whipped cream, and you don’t have to bother with gelatin. Good luck and enjoy! Yummy !! Can this be used to frost an ice cream cake ? Could I add coco powder to make this chocolate? If so how much? I love a good light frosting like this! Ok Allie, I’m a believer. This is delicious. Thanks so much! So happy you like it Mariel! Thanks so much for the positive feedback! If I want to use marscapone, do I use 8 ounces to replace the cream cheese? Yes, that’s right! Good luck Madeline- hope you enjoy! PERFECTION-this is totally my ideal frosting! This was perfect for the ice cream cake I made today. Thank you. That’s so great to hear Jaci! Thanks so much for the great feedback! This recipe was delicious. So easy to make that my 10 yo made it for her daddy’s birthday cake. I will definitely make it again. Thanks! So happy to hear that Katherine! Thank you so much for the positive feedback and happy belated birthday to your son or daughter’s dad! Hi, I’m in the UK and they don’t sell block cream cheese here only in tubs, what do you recommend? Hi there! It’s tough for me to say without having worked with the kind of cream cheese you’re talking about. If it’s the only thing you can get, then I guess give it a try and see how it works? I know that the tub cream cheese here in the US does not work well, but maybe it’s different where you are. Good luck and let me know how it works out! Hi, I also have the same problem. Cannot fing block cream cheese anywhere in my town. Did you try using the tub? Please let me know how it turned out. Do I need to soften the cream cheese before beating it with the powdered sugar? Should I lessen the heavy cream, if I add a fruit puree to it? Do you think it would still hold up for piping? I haven’t really tried doing that, but if you do I’d be so grateful if you’d let me know if it works! Thanks Lisa! You can use freeze dried fruit powder in many different flavor’s! 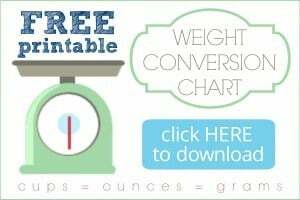 Only 4 gram is one portion of fruit! It taste delicious and is so easy for frosting or in a cake. There are many ways where you can use it. When you search the internet, you’re gonna find it. I’m sure of it. Cos that’s How i found it. Wish you good luck. Amazing and so easy! I threw everything in my Vitamix, hit blend and 30 seconds later you have an amazing all purpose whipped cream/frosting. I can’t wait to try adding some chocolate Keto Cocoa. Only change I made was using 2 cups cream because it’s just easy to add a pint only and used swerve for sugar. Thanks! So happy it worked out well for you Roni! Thanks so much for the feedback! Why can’t we use cream cheese from a tub? Is it because of the water yhatthat’s in the air bubbles? It’s a completely different product and you won’t get the best result. How many cupcakes would one batch cover? Hey Tammy! This recipe makes enough frosting for one 6-inch diameter, 3-layer cake, one 8- or 9-inch diameter, 2-layer cake, or 24 cupcakes. Thanks for the great question! I’m looking to make a vanilla cake and possibly flavor it watermelon, would this frosting be a good match? Dose it have a cream cheese taste? Also is it grainy? most frostings are grainy from the sugar. Hey Stephanie! This is one of my favorite frostings. There’s not a whole lot of cream cheese (just enough to stiffen the whipped cream), so the taste is pretty mild. I find it to be a lot less grainy than say an American-style buttercream, because the cream does a good job of dissolving the sugar. Another good option for you might be Swiss meringue buttercream. I just made this for my daycare kids as I wanted something a little less sweet, it’s incredible,my new go too. Hooray! So happy you and your kids enjoyed Shalise! Thanks for the good feedback! Can I use 1/3 fat cream cheese in this recipe ? Also can it be frozen ??? I was thinking about making cream puffs with it and freezing them. Hey Aneta! Full fat cream cheese is best. The kind in a brick. I’m not sure if it freezes well- I’ve never actually tried doing that. Good luck and thanks for reading! Will it get stiffer if I use less heavy cream? Mine didn’t hold up well after piping it onto the cake, but it was still delicious. It should yes! Stiffer indeed but less fluffy. Hope that helps! My 8-year-old daughter complained that this frosting is too fluffy! (Is that even possible?) This frosting is wonderful – light, airy, with a touch of sweetness. I wish I could post a picture of the cake she made for her father’s birthday with it. Haha! Well I’m so happy you enjoyed it! Thank you for the positive feedback! I used this for the Cook’s Illustrated lemon layer cake- with frosting roses and it turned out great. They held their shape and had a great light flavor. I’m so happy to hear it Madeleine! Thanks so much for the positive feedback! Sounds a little silly, but I made this just for fun and then froze it, and it makes GREAT ice cream! That’s actually a great idea! Thanks so much for sharing Mireille! Hey there! I will be making about 150 mini cheesecakes for an upcoming bridal shower and will be using a dollup of whipped cream on top of each. I am planning on making this either the morning or the evening before and putting in a piping bag to pipe the cheesecakes at the venue. Would you suggest making the frosting the night before or the morning of? Also, after I make it can I put it straight into a piping bag or will it need to be re-whipped before it is piped? Hey Cyndi! I think your best bet would be to make it the morning of. If it seems a little loose when you go to put it in your piping bag, just give it a quick whip to fluff it back up. Good luck and I hope everyone enjoys! Hi! This looks delicious! Do you think I can get the same results using a hand mixer? Hi Nina! I think you most definitely can. It will be helpful if you start with room temperature cream cheese. Good luck and let me know if you have any questions! Can I make a 5 later cake and use this for in between the layers and to frost the cake? Will it hold up well over night? I can’t imagine why not! I don’t know what size cake you have in mind but if it’s very large you may just have to double the recipe. Good luck! Will it hold up to flavoring and food coloring? Do i need to add more powdered sugar to counteract the added liquid? It should be fine as long as you don’t add more than a few tablespoons. Good luck! Hi what is the measurement for mascarpone cheese if I’m substituting it from cream cheese? Hi Chrissy! You can use the same amount; mascarpone and cream cheese can sub for one another in equal measure. Good luck and enjoy! How many cups does this make I’m doing a two tier chocolate coconut cake and need to know if it’s going to be enough to cover the outside of the cake? Hey Sheena! This recipe makes enough to fill & frost 1 triple-layer 8-inch cake, 1 double-layer 9-inch cake, or 2 dozen cupcakes. Good luck! Sounds great! Good luck and enjoy! Sounds great! I’m anxious to hear. Happy anniversary to your parents! My pleasure Wendy! Thanks so much for the positive feedback! Hi there! Am I able to color this frosting if I use gel color? Thank you!! I’m excited to try this either way. Hi! Yes that should work! Does it have to be gel coloring or any coloring? Gel is best because it won’t dilute the frosting. I was looking for an easy whipped cream frosting recipe for some cheesecake cupcakes I had made for a work gathering. When I saw how easy this was, I knew it was the one to try. I didn’t realize until I was midway through that I only had 2 cups of cream, but it worked out just fine. I decorated the cupcakes last night with a piping bag (with the wide star tip, like in your video) and it held up perfectly overnight. The best testimonial of this frosting is that my husband loved it (he does NOT ‘do’ whipped cream). Thanks so much for sharing your talents with us! Wow that’s so great to hear Jean! I’m so happy you and your husband enjoyed. Thanks for the great feedback! Could you specify how much of each ingredient I should put in? Hi Selena! I’m afraid I’m not sure what you mean- all of the ingredients, their amounts, and the step-by-step directions are listed on the recipe card. ?? How long will this hold up on a cake once the cake has been removed from the fridge? Hi Shanna! It should be good for several hours, or maybe even overnight. Good luck and enjoy! Thank you so much for these perfect cream frosting i have been desperately looking for to solve my problems of the regular whipping cream deflating or weeping, you are sent from heaven! Let me ask how many ounces of cream cheese would i need if i am using 400ml of whipping cream? Hey Faith! I’m so happy you’ve been pleased with this recipe! One cup of cream is equal to about 237 ml. This recipe calls for 2 3/4 cups, so you are going to want to do everything a little less than double. I’d say about 12 to 15 ounces of cream cheese, 2 1/3 or so cups of sugar, and a couple teaspoons of vanilla. Good luck! Can you color this frosting or will it break? You can color it! I prefer to use gel color; it’s less watery. This was very informative and enjoyable to read! I am making this in a couple weeks for my daughter’s birthday. So happy you enjoyed Amber! Happy birthday to your daughter! I am new to baking and have only had real success decorating cakes with fondant and Ganache so far. I tried American butter cream once but was too buttery and sugary and grainy for me 🙂 then I tried flour buttercream once and it was almost a disaster as it was not holding its shape. I had to pipe each flower on baking paper and freeze, only to be added on the cake at the last minute. So I don’t want this to be a last minute disaster. Any tips would be much appreciated. This time I am only aiming at covering the cake with multi colour horizontal stripes only so should be fine. My main question is that I will be frosting the cake night before the day. Do I store the cake in fridge overnight? and does the cake need to be crumb coated first followed by a top coat? (this will give me an idea of how long the whole process will take as the cake will have to be in the fridge between the two coats.) How do I store the frosting while the cake is in the fridge? How do I store the left over frosting once the cake is fully done to be possibly used on cup cakes or piping rosettes etc on the cake on the day? zip lock bag or piping bag? Hey there! I’m so glad you’re going to give this recipe a try. It’s one of my top favorites! You have some really specific questions and I would recommend you go back and read the entire post, because many of them have already been answered there. Your questions about how far ahead you can make it and how it should be stored are addressed under the heading “How long does whipped cream frosting last?” and your question about piping is answered under the heading “Is this whipped cream frosting good for piping and decorating?” As for whether or not you need a crumb coat, that is really going to depend on the cake you are using it on. If it is a crumby cake then I would plan for that extra step. Most of my cake recipes on this site will not require that though. If there are any other questions I haven’t already addressed, feel free to reply to this comment- I’ll do my best to steer you in the right direction! Hope that’s helpful! hi, is this also okay to frost on a chocolate mousse cake? You can put it on anything you want! This is the creamy, tasty, and easy to frost recipe I have been looking for. My adjustments are 4 oz cream cheese, 2 oz butter, 2 cups heavy whipping cream, same 1 cup powdered sugat, 1 tsp vanilla. Piped and frosted perfectly. So happy you like the recipe Linda! Thanks so much for sharing your adjustments! This frosting recipe looks delicious. I wonder if I could substitute the powdered sugar with a Stevia blend? If so, what would be the correct amount of the Stevia blend? Hi there! Sorry, I have never tried that so I can’t say for sure. This is exactly what I was looking for.. need it for a Circus Animal Cheesecake, thanks so much for sharing..
My pleasure Regina! Hope you enjoy! I have used this recipe several time. I am always overjoyed with the result. It is not too sweet, easy to spread, and delicious to eat. Thank you for sharing it with us. It’s my pleasure! I’m so glad you’ve been happy with it Maria. Thank you for the positive feedback! Will this frosting hold its shape for rossettes on the side of a cake? Hi there! You might want to check out the info under the heading “Is this whipped cream frosting good for piping and decorating.” I have used it to pipe on cupcakes and it works well but I think you’d be taking a chance with side-of-cake decorations. Could I add food coloring to o this? I made this frosting to go on a Pumpkin Pie cake. It was delicious!! Don’t worry about it tasting like cream cheese frosting – it doesn’t. It tastes like whipped cream. It doesn’t have the holding power that buttercream has, but the cake was so delicious, it didn’t last long anyway. I’ll definitely keep this recipe in my notebook – would love to try it on cupcakes. So glad you were happy with it Lori! Thanks so much for the 5-star rating! My son eants me to make a lemon meringue pie. Problem is, his wife hated meringue. I was thinking of using this as a topping, with maybe a lemon zest on top. Thoughts? I’m so sorry Chinky! I don’t know if there is any way to bring it back once that’s happened. Hey! Random question–if I’m using this frosting for your perfect vanilla cupcakes (which makes 24 cupcakes) is one batch of this enough or should I double it or ? Thanks girl! Hey Kayle! You should be good with just a single batch. This recipe makes enough to fill & frost 1 triple-layer 8-inch cake, 1 double-layer 9-inch cake, or 2 dozen cupcakes. Hope you enjoy! So I chilled my bowl and mixers over night. My cheavy whipping cream was cold.. as was the cream cheese. It never thickened up at all 🙁 what could I of done wrong? What kind of cream cheese did you use Shawnee? Hi! May i check is mascarpone comes in a brick form as well? i can manage to find those in tub. Thanks!! Hi there! At the stores where I normally shop, I have not seen mascarpone in a brick. Maybe it’s sold that way elsewhere? I’m not sure but I think if all you can find is mascarpone in a tub, it should work ok. Good luck! Have you ever added Wilton Icing color to this icing? If so, at what step would I add it? Yes you can use gel colors to tint this, just fold it in to the finished frosting. Good luck! I’m asking a question that hasn’t been asked on this post. I’m planning to make a 3 tier cake covered in fondant. I absolutely love this recipe – I used it for my 3 layer chocolate cake and it was so smooth and delicious, not grainy at all. I really want to use this recipe for the fondant cake as my customers don’t like buttercream. My question is can I use your recipe for layering the cake but use a thin layer of normal buttercream just for crumbcoating and applying fondant. Do you think that will work? I’m planning to make the whole cake a day or two before the birthday party. I can’t imagine any reason why that would not work. Good luck! 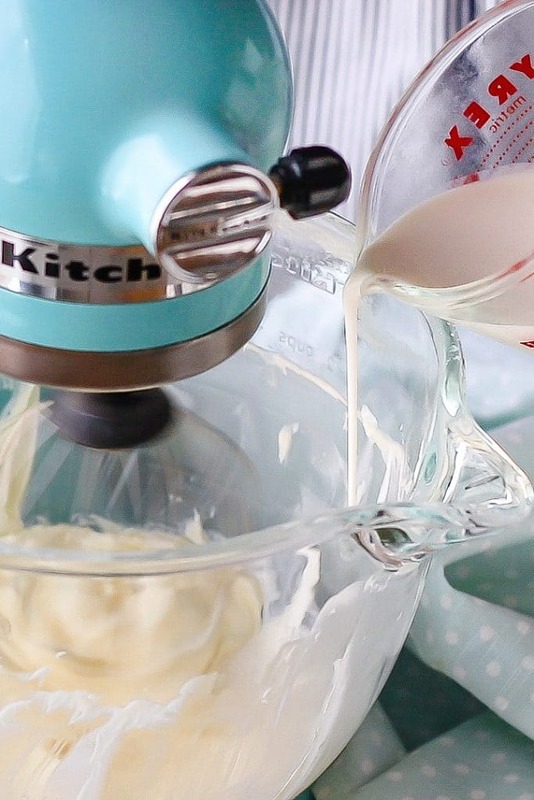 A random question, can I make this frosting without a stand mixer and a hand mixer? Aka… making the frosting by hand. With a whisk. In a bowl. Would it work or would it cease to exist? Hi Daniel! You can certainly try, but I think it would be more difficult since cream cheese is so thick and dense. Your arm will get a good workout! Thanks so much for this super recipe- incredibly helpful directions for icing my daughter’s first birthday cake. It had burnt slightly and I needed to disguise the bits I had to chop off… this icing (along with some berries) completely rescued me and made the cake a resounding success. Thank you! That’s so great to hear! Happy birthday to your daughter and thank you for the 5 stars! Love love love it! Used the frosting for hot chocolate cupcakes. That sounds amazing! So happy you like the recipe. Thank you for the good feedback! Hi! This is my new go-to vanilla frosting for chocolate cupcakes and everything else, basically. The slight tangyness cuts perfectly the richness of the cakes making them lighter and tastier. Have been using it at least every two week. My pleasure Oona! I’m so happy you like it! I want to use this recipe for a baby shower ruffle cake and when can I add the color gel to tint it? Add the color to the finished frosting. So happy you liked it Pat! Hoping to make this to fill a two-tier cake. Question is will it hold if I fill my cakes and freeze them? Planning to fill and freeze them and the day before the party frost them and decorate. Hey Sylvia! I’m so sorry but I have not tried freezing this frosting so I can’t say for sure. I would imagine that worst-case scenario it might separate a little as it thaws, but if it’s only between layers that might not be too bad, since the moisture would just soak into the cake. Sorry I can’t be of more help with this question! I love Angel Food cake but I don’t like the traditional egg-white frosting most people put on it. So I was looking for a suitable replacement. I stumbled across your recipe and tried it today. Wow, I love it! I love that the taste of the cream cheese is very subtle, I love that when it sets is stays in place. I did not add the extract, it was perfect without it. Thank you so much for sharing it with us. My pleasure Martha! I’m so happy you liked it. Thanks so much for the positive rating! Recipe looks delicious!! The only way I can find marscapone cheese is in a tub…will that be OK?? I think that should work just fine Wanda! How much icing is needed to frost a triple layer, 9 inch cake? Would you make 1 and 1/2 times the recipe? That would definitely be the safest way to go. You might be able to get it done with just one batch, but another half batch would definitely give you plenty, plus a bit extra left over. Good luck! Is there any chance I could sub 1/2 and 1/2 for the heavy cream? I really want to try this recipe out on my kids before using it in their birthday cupcakes but babies napping and I that’s my ‘experiment’ time! Thanks! Hey Allison! You can try it but I’m pretty sure it won’t work. Nothing really whips up fluffy like heavy cream. Sorry! This recipe looks amazing. I’m going to try it this weekend! Is there a reason you wait until the end to add the vanilla? Not really! You can add it at any time. Hope you love it Janell! All the measurements are listed in the recipe card located at the bottom of the post. What a game changing recipe! I always have all 3 of that’s ingredients in my kitchen. You are the best! I made a strawberry poke cake with your whipped cream frosting and everyone loved it. Thank you for sharing this recipe. I’m so happy to hear that! Thanks so much for the great feedback. 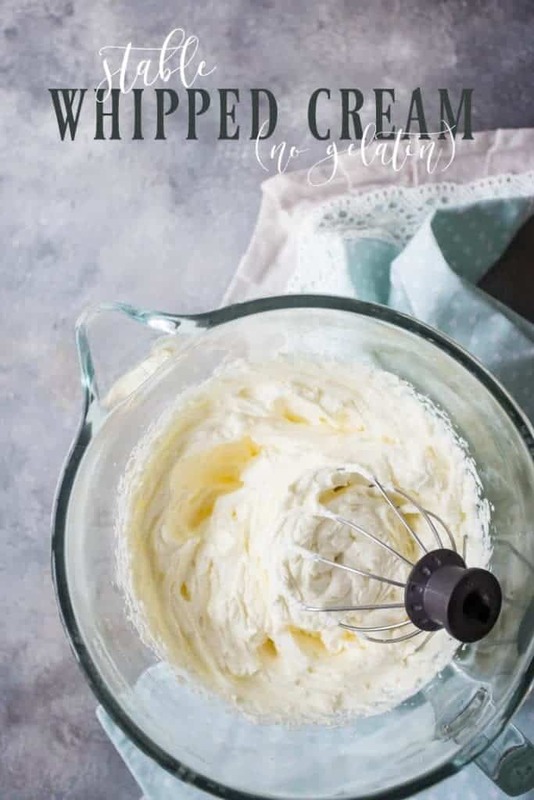 I have been looking for a stable whipped icing recipe for a long time! I can’t wait to try this one out. I am making a baby shower cake this weekend and the customer wants whipped icing. I’ll let you know how it turned out! Great! Good luck I look forward to hearing back from you! Really easy to make. Tastes wonderful with red velvet cupcakes! Great! So happy you enjoyed and thanks for the positive review! Do you think it’ll be a bad idea to add vanilla extract to this? This frosting is my go-to for everything cakes and cupcakes now! Thank you so much. I love that it’s a frosting you can’t get enough of as it’s not too sweet. So happy to hear that Joanna! I’m with you- less sweet frostings are the way to go. Thanks for the excellent feedback! I’ve actually been making a version of this for years. It’s sooo good. Here in the UK we dont have cream cheese in a brick – just the tub kind. And it works fine. I dont use as much as you do and the frosting holds its shape really well. I have decorated cupcakes and layer cakes with rossettes and flowers many times without a problem! So great to hear! Thanks so much for chiming in Aneesa! its this recipe a whipped icing like “bettercream” ? Hey Linsey! I’m so sorry but I have never heard of bettercream. But if it is dense and super sweet then I doubt this is anything like it. This frosting is light and fluffy, and just a little bit sweet. My pleasure Jen! Hope you enjoy the cake! I bought a dollar cake mix for my 10 year old to bake. My friend bought flats of strawberries to share with me and others. I had the 3 ingredients on hand for the whipped icing. After the child made the cake and went to bed, I made this icing. I didn’t know if it was going to work using my Ninja bullet so I kept it a secret. I made sure the cup from the processor and the cream was cold before I mixed the ingredients.I sliced the strawberries and placed them between two layers and after successfully making the whipped cream frosting with my counter top Ninja, I topped the strawberries with the cream icing .It was fast, easy and cheap. I didn’t even have to go out to get ingredients. It made her simple cake exquisite and made her proud to share it. So delicious I don’t even care that we didn’t get to the Strawberry Festival. Aw, so happy it worked well and that your daughter was proud! That’s just so awesome to read. And great to know that it works in a Ninja too! Thanks so much for sharing Cindy! I just made this tonight and I gently folded in some cherry compote I made to fill some chocolate cupcakes. Holy wow! It was absolutely perfect. Not to sweet and it is super simple. Definitely making this more often! Sounds fantastic! I love cherries… thanks so much for the awesome feedback! Is it possible to sub the creamcheese with something lighter in flavor like marscapone? I think that would probably work ok! Will adding some butter makes this frosting easier to pipe & cover the whole cake? I tried this recipe n it’s really nice. Wondering if adding some butter makes this frosting easier to pipe & cover the whole cake? Not sure- I have not tried that. How do you feel this would fair onca two layer tres leche cake? With strawberries and the whip cream in between the layer? Could I put edible cupcake toppers on it without the fear of it melting into the icing . I would think so, but I have not tried that myself so I can’t be 100% sure. I tried this for a very special Birthday and came out perfect, I wanted to add cocoa but didn’t want to ruin it. Thank you so much, this is fantastic! You’re so welcome! I’m so glad you liked it! I’m making this for a camping dinner and will only have my hand mixer. Will this work? I think if you have a whip attachment on your mixer, and your cream is nice and cold, that shouldn’t be a problem. Good luck and have a great trip! I read the other comments and only saw one person ask if you have tried adding cocoa powder but didn’t find a reply from you…have you tried it..and did it work? No I have not tried it- sorry!